How much does it cost to travel to Turku? How much money will you need in Turku? €109 ($123) is the average daily price for traveling in Turku. The average price of food for one day is €26 ($29). The average price of a hotel for a couple is €121 ($137). Additional pricing is in the table below. These average travel prices have been collected from other travelers to help you plan your own travel budget. 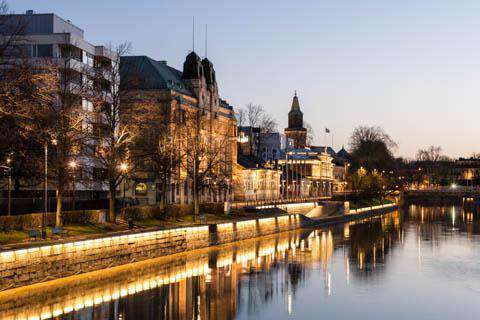 Turku, a city on the southwest coast of Finland, straddles the Aura River. Dating from the 13th century, it's known for Turku Castle, a medieval fortress with a history museum, perched at the river mouth. Restaurants line the cobbled riverside streets. On the eastern bank lies the Old Great Square, a former trade hub, surrounded by grand buildings. The nearby Turku Cathedral houses a royal tomb and a museum. The historic castle and cathedral point to the city's rich cultural history when it was the Finnish capital, and contemporary Turku is full of experimental art and vibrant festivals, thanks in part to its spirited university population (the country's second largest), who make Turku's nightlife young and fun. As the first city many visitors encounter arriving by ferry from Sweden and Aland, it's a splendid introduction to the Finnish mainland. Turun Linna is Tuku's most popular sight. Founded in 1280 at the mouth of the Aurajoki, mammoth Turku Castle is easily Finland's largest. Highlights include two dungeons and sumptuous banqueting halls, as well as a fascinating historical museum of medieval Turku in the castle's Old Bailey. Models depict the castle's growth from a simple island fortress to a Renaissance palace. Guided tours in English run several times daily from June to August. Turku Cathedral, the 'mother church' of Finland's Lutheran faith, towers over the town. Consecrated in 1300, the colossal brick Gothic building was rebuilt many times over the centuries after damaging fires. Upstairs, a small museum traces the stages of the cathedral's construction, and contains medieval sculptures and religious paraphernalia. The cathedral's pulpit was designed by German architect CL Engel (who, in the spirit of impartiality, also built the Orthodox church on the market square). Romantic frescoes by RW Ekman depict the baptism of Finland's first bishop and Gustav Wasa presenting the nation with the first Finnish New Testament. Its most famous tomb belongs to Karin Mansdotter (d 1613), Queen of Sweden and wife of the unfortunate Erik XIV. Turku City Center provides an excellent base for exploring the sights of Turku in-depth. In this part of town, there are several impressive landmarks to visit such as SS Ukkopekka Cruises, Qwensel Apteekkimuseo, Svenska Teater. Turku City Center has a lot to offer: famous sites, plenty of shops, great restaurants, and a range of exciting entertainment. Turku Harbour is one of the cities most visited destinations. With a wide number of attractions to discover, this sought-after part of town will not cease to amaze you. Turku Harbour has lively surroundings, fine restaurants, shopping areas and stunning attractions. Luostarinmaki is one of Turku's many neighborhoods that travelers like to visit. It is renowned for its many sought-after attractions including Luostarinmaki Handicrafts Museum, Samppalinnan Outdoor Swimming Stadium, and Turku Biological Museum. Providing warmth and comfort, Luostarinmaki makes for a relaxing holiday destination after a long week of working. Aboa Vetus & Ars Nova is a history and contemporary art museum - an unique cultural attraction. The museum is a fascinating combination of old and new that invites the visitor to explore the medieval history and culture of Finland. Art and archaeology unite here under one roof. Aboa Vetus (Old Turku) draws you underground to Turku's medieval streets, showcasing some of the 37,000 artifacts unearthed from the site (digs still continue). Back in the present, Ars Nova presents contemporary art exhibitions. Museum's Aula Cafe holds tasty Jazz brunch every Saturday. A nice sail around the archipelago is another great way to spend some time in Turku. But you don't have to be an avid sailor with experience of sailing the Seven Seas to fully enjoy the uniqueness of the Turku Archipelago. The archipelago is among the world's largest - and to some among its most beautiful - the archipelago is accessible by foot, bike, connecting vessels, ferries, car or waterbus. The Turku Archipelago is all about rugged untouched nature, but it also hides surprising oases where you can relax with a round of golf, a spa visit or satisfy the gourmand in you. In addition to the many options of exploring the archipelago, there are also many other outdoor activities to enjoy in Turku. Hiking, Cycling, Snowmobiling, Rafting, Skating, and Husky and Reindeer adventures are only a few of the many options available in this natural wonderland. There are also several museums to enjoy. Turku is full of great restaurants and cafes such as: Cafe Art, Tinta, and Gaggui. Gaggui is a great example of how a Restaurant Day Pop-up restaurant can turn into a full time job, if one has courage and creativity. When hungry head to Turku's River bank - filled with all types of restaurants, with different budgets. Turku Airport is located approx. 7 kms from the center of Turku, and Turku is also accessible by train from select cities. In Turku it's easy to get around by car, as well as on public transportation. Cities and towns have an efficient public transportation system, and longer distances can be covered in the comfort of long-distance buses and trains.